At long last one of the great toku heroes of the '90s joins the S.H. Figuarts line! Hailing form the classic Metal Hero series Tokkei Winspector, today we look at S.H. Figuarts Fire! For a little background on the series (which if you know me you know it's one of my all time favorites) Tokkei Winspector was produced from 1990-1991 but featured a plot set in the near future of 1999. The Tokyo Metropolitan Police Department, faced with rising crime & technological advancements aiding crime, creates Winspector as a special operations unit. One that can tackle threats beyond the capabilities of normal Tokyo MPD officers. Uniquely that meant that Winspector more often than not faced the threat of average criminals or normal people in extraordinary situations rather than a real villain of any kind. No evil organizations here. It was a refreshing premise followed up upon by it's successor as well. Our main hero is Ryoma AKA Fire, a highly skilled police officer and the only human member of the trio. He's helped by his robotic but heroic teammates Bikel & Walter. This series also marked the beginning of a sub-series within Metal Heroes known as the Rescue Hero Trilogy. 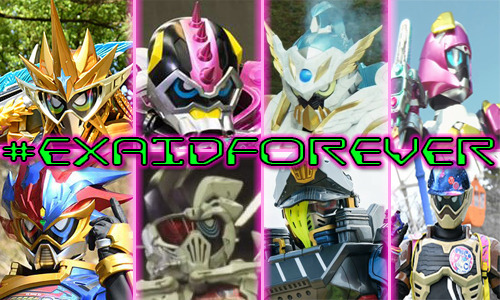 Winspector would be followed up by Tokkyu Shirei Solbrain and finally Tokusou Exceedraft. Interestingly the link between these 3 series is Winspectors' commanding officer Shunsuke Masaki. Not only is he the founder & chief of Winspector, but after the series ended and the unit was sent to France he went on to found Solbrain as their successors in Tokyo. The 2 teams would eventually team up and Ryoma now known as Knight Fire would become a recurring member of Solbrain's cast. The 3rd series, Exceedraft, would also feature Cheif Masaki to a much lesser extent as the former chief of Winpector & Solbrain, as it was originally intended to be the start of a new continuity of Metal Heroes. Interestingly enough Chief Masaki's actor, Hiroshi Miyauchi, has appeared through out all of Toei's major tokusatsu franchises as well. Besides his involvement with the Rescue Hero Trilogy he was also the actor who portrayed Kamen Rider V3, Big One, Chief Miura in Ohranger, Zubat, & Aoranger! Now on to the figure you're here for! I always love it when a new S.H. figuarts subline begins because we get a sort of refresh on the packaging we've gotten used to. The slim style box is here to stay it seems and I'm totally fine with that. In this case Fire gets a nice prominent shot across the bottom of the box with the Winspector logo printed on the plastic window. It feels like there's less room for stock photography on the back of Fire's box. But we aren't buying it for those photos. I do however really like the monotone art on the spine of the box. Packed in with Fires' instructions is also a flyer advertising the upcoming Tamashii Web Exclusive S.H. Figuarts Bikel! That's 2 out of 3 team members down. Refreshingly S.H. Figuarts Fire is an all new mold. which is the other best part about a new subline. Bandai has had some missteps in the past with Metal Hero figuarts but it looks like they've finally begun to course correct. We've finally gotten past broken wrists on the Space Sheriffs and the wonky barely functional hips on the B-Fighters. 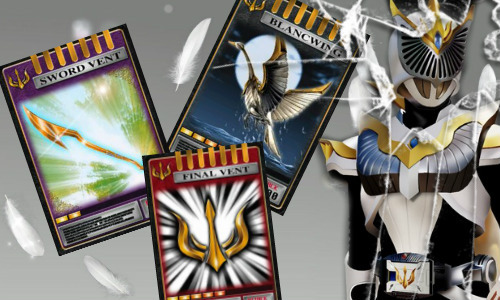 Fire shows us what Bandai can do with his unique design. While the lower half of his body doesn't have much going on we're back to nice flat feet, no curved clown shoes like the B-Fighters. We also get fully functional hips with a decent range of outward and forward/back motion. Far more than previous Metal Hero releases have been capable of. Both Bikel & Walter will feature the same legs. On Fire's right hip is a holster to carry the included Daytric M2. Now the upper body has some truly incredibly detailing. Fire features some really exquisite & intricate technological molding all over his abdomen, chest & arms. It's just superb how they've managed to recreate the show suit. While anything being taken from life-size down to this scale will undoubtedly miss some things, as far as broad strokes are concerned Fire is one of the most detailed figuarts to date. Right down to the crisp paint apps on the various panels and switches molded into his body as well as the really sharp looking Winspector logo on his abs. Much like the torso the arms also have nice asymmetrical detailing, most prominent in the shoulder pads. I don't know why but those shoulder pads have always drawn me to this design. The same way that a Zaku II from Mobile Suit Gundam manages to look just so classically good. My one gripe with the arms, and this may just be isolated to my Fire, is that the elbow pads will fall off for any reason or no reason at all. Perhaps the best feature of this figure is the just dead on perfect helmet. When Ryoma's Crush Tector suit begins to bond to him during transformation it starts with the body armor forming first. The helmet is the last component. When it appears on his head, his human eyes are still visible until a slit drops down with the bright yellow robotic eyes of his helmet. Then the semi-transparent visor slides down over these. This gives off a look very reminiscent of many Metal Heroes through out the franchise that would feature glowing eyes inset glowing eyes. The toy replicates this bit of the transformation by having a hinged visor. You can display him however you wish but traditionally Fire's visor would be down. Though this is probably the best job Bandai has ever done of making the visor just transparent enough to make the eyes appear to be glowing behind it even when it's down. Fire is just an excellently sculpted & engineered figure. I mean it when I say this is the best Metal Hero figuart to date. However there are numerous small details missing. For every panel line or indicator that is painted there's at least another that isn't Like the the 3 square indicators behind Fire's com link that are unpainted on the figure. The nice thing about this figure is that is also finally allows me to bust out my vintage Winspector collection for this gallery! While S.H. Figuarts Fire may appear to be just a tad bit too large to scale with vintage Winspector vehicle, it's actually pretty spot on. He fit's in perfectly with Bikel's Winchaser so now I know when Bikel's released he'll fit in perfectly. Likewise Fire, while a little on the large side. looks great with a vintage DX Winsquad/Firesquad. He can just barely fit in the driver's seat but the canopy will close around him. I love having vehicles that scale with my figuarts so for me this is like heaven. 6 - additional hands. 3 pairs of match sets. No unique or special hands. Open palms, trigger fingers, and open fists. 1 - Daytric M2. The multi-purpose standard sidearm of the Winspector trio. Each member caries this item in a right hip mounted holster. The Daytric M2 in it's standard form is a pistol. Sadly I have to point out that it isn't even remotely fully painted. It's cast in a cheap black plastic with minor red trim as the only painted detail. Which simply isn't accurate, not even close. None of the proper detailing is present. The Baton mode can be achieved by flipping the barrel up and sliding the scope forward. It's a bit of an unorthodox design but it does the job of being a nice melee weapon. It's a smooth easy change between modes at least. 1 - Max Calibur. This is Fire's main weapon of choice. A powerful blade comparable to the Space Sheriffs Laser Blades. 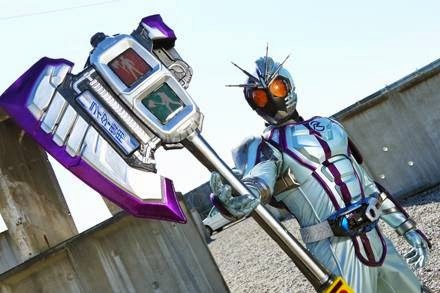 The design of this weapon is clearly what influenced Blue Beets' Stinger Blade 5 years later in Juuko B-Fighter. The figuart version of this weapon is mostly hollow but designed much much better than the figuarts version of the Stinger Blade. Learning from their mistakes there Bandai has ensured a snug fit on the arm with this weapon. It fites just over the forearm so you don't have to worry about it's weight making it fall. Sadly this accessory count could have been much MUCH better. The far older Action Works Winspector 3-pack produced by Megahouse gave us very complete feeling releases of all 3 Winspector members. Now of course begin 8 years old, that set is neither sculpted nor painted as well as S.H. Figuarts Fire. But not only did Action Works Fire include an array of hands, a properly painted Daytric M2, & the Max Calibur, it also included a to scale Winbadge, the Handwapper, the Gigastreamer, the Clapper, & all 3 versions of the Multipack. Now again that was a 3-pack of the entire team, but it included all of the relevant accessories for each member and originally retailed in 2008 for 9800 yen. S.H. Figuarts Fire retails (before retailer discounts) for 6480 yen and includes only a fraction of the same accessories. Yes there's something to be said for the passage of time and increasing production costs. But wow. What a difference. S.H. Figuarts Fire just feels like it should & could have come with so so much more for that price. I'm happy with what we got but if at all possible I'd suggest finding that old 3-pack for the additional accessories. 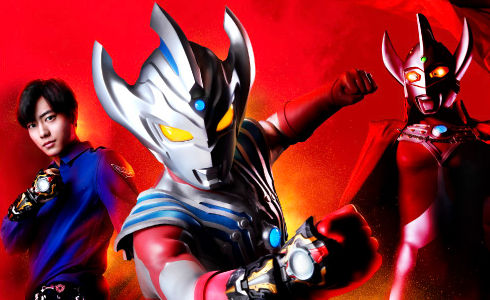 As an obsessed fan of Metal Heroes & this series in particular, I had high hopes for S.H. Figuarts Fire. Did it meet all my expectations? For the most part yes. But it still could have been a bit better. The accessories are what really hurt this release. In the same way I once compared S.H. Figuarts Gavan to his Action Works predecessor, I can't help but feel Bandai didn't learn from Megahouse's success with that line. With Winspector the additional weapons are where it's at. Numerous times the Multi-Packs and additional weapons for the team have been shown off at Tamashii Events with prototypes of the figures. But none of those accessories have ever been confirmed for release. Bikel won't be including any of them them, but would Bandai really be so bold as to pack all of that stuff in with Walter? Time will tell. As is S.H. Figuarts Fire is a great figure. It really is. As Bandai perfects Metal Hero figuarts they continue to improve from release like the B-Fighters with their atrocious hips and the even older Space Sheriffs with their easily broken wrists. Fire is clearly their best effort to date for this franchise. I'd love to see this figure retooled into his upgrade Knight Fire from Solbrain as well. I would highly recommend picking him up if you have the chance. Also he's due for a release BY BLUEFIN. Why they didn't release the B-Fighters, we will never know. Why they didn't release the B-Fighters, we will never know. Those are Tamashii Web Exclusives. Web exclusives have different rules to be imported by Bluefin. With Kamen Rider, Ultraman and Metal Heroes retail releases, they can release them if the license holder agrees to it. I think Toei didn't see the market for B-Fighters to be imported over in the US. Beetleborgs has a cult flowing, but it's not as mainstream compare to MMPR. Yeah that kind of blew my mind too. They anounced his release like a month after I'd gotten an Amiami pre-order in already. The upside is since they will be distributing him I can nab a couple of extras through work for custom ideas and alternate displays. More or less. It's not quite clear if the B-Fighter issues were on Toei's end or on Saban's but somehow it was implied their web exclusivity precluded them from release here. That hasn't always been true of Tamashii products as we well know with Godzilla & DBZ, but for Riders Sentai & Metal Heroes the rules seem to be different. I don't know why they'd seek to release a figure like Fire with almost zero visibility to the main US market, but oh well. I'll take it. I'm pretty happy with Fire. He's not perfect, (his leg articulation is better than the B-Fighters, but still not quite right) but I like him enough that I'd like to get Bikel and Walter. Oh same here. Even if I wasn't already a huge fan of the show and toys I'd be getting Bikel & Walter to compliment Fire. This line is a move in the right direction after the missteps of the B-Fighters so I'm thrilled for more. Here's hoping these eventually lead to Knight Fire & the Solbrain team too. It looks like a very nice figure. Den-O I seriously hope you complete this metal hero collection thing you got going on. Would love to see Janperson and Gungibson in the mix one day.